The Snow Shoe Rails to Trails was formed in 1999. We are all volunteers & maintain the trail with your membership dues. The trail is for walkers, bikers, equestrians, atvs & snowmobiles. ABSOLUTELY NO DIRT BIKES. Dirt bikes are not registered with PA or DCNR and they are not required to carry insurance, so we cannot allow them on our Trail. We have 19 miles of abandon railroad bed along with 20 miles of legalized Snow Shoe Township Roads. 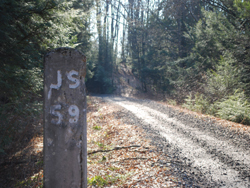 In August 2011, DCNR connected us to the Bloody Skillet Trail near Orviston. We now have approximately an 80 mile trail system. The Snow Shoe Rails to Trails System is open year around. However, the Bloody Skillet Trail is a state system & is closed certain times of the year. So, check the DCNR web site to determine specific dates etc. Motorized units must be registered with the club to ride the trail. You must provide state registration & insurance information to register your motorized units. Plan according: Turn around time for a membership sticker is usually 10 days. That is from the time you send in your application till you receive your membership. However, we do have several local corporate sponsors that handle the applications & can provide you a membership sticker on site. View them out on our membership page. We have 12 gates with bollards along the trail. The bollard width is 65 inches wide. So, your motorized unit needs to be less than 65 inches to ride the trail. Our mission is to provide a safe, family oriented place to ride along with other trail users. We want to show case our Centre Region's natural beauty, making it available for all to enjoy. The SSRTA firmly believes in partnering with local businesses and local government - thus creating a riding experience linking town to town. The SSRT Trail is mostly made up of original rough ballast, suitable for only the type of bicycle that can navigate through really large limestone. 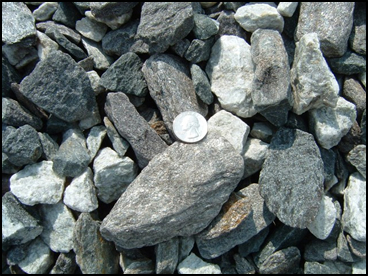 This surface is present from Black Bear Trailhead to Gillentown Trailhead ( approximately 15 miles). 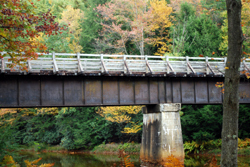 At Gillentown towards Clarence, approximately 4 miles-there is a Driving Surface Aggregate, that is much smoother for hiking, biking and horse back riding.